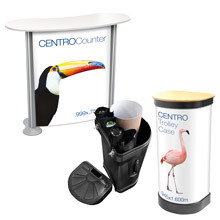 The excellent Centro Modular Display System has just got even better! 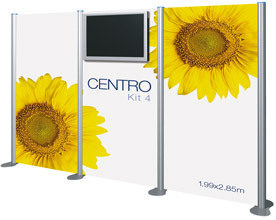 Centro is a superb panel system. 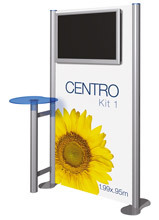 Centro also comes in a number of pre-configured kits for your convenience. Or you can choose to buy on a custom basis to suit your exact requirements. 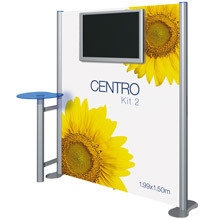 You can build a complete, re-usable exhibition stand from Centro and the use part of it for your smaller shows. The upgraded 2014 system features a superb and unique "Twist and Lock" system for the poles and graphics frames. That means an even easier, faster, more secure and hassle free set up, saving you time and effort. In addition, a number of new modules have been introduced including display pod shelving and door frame sections. 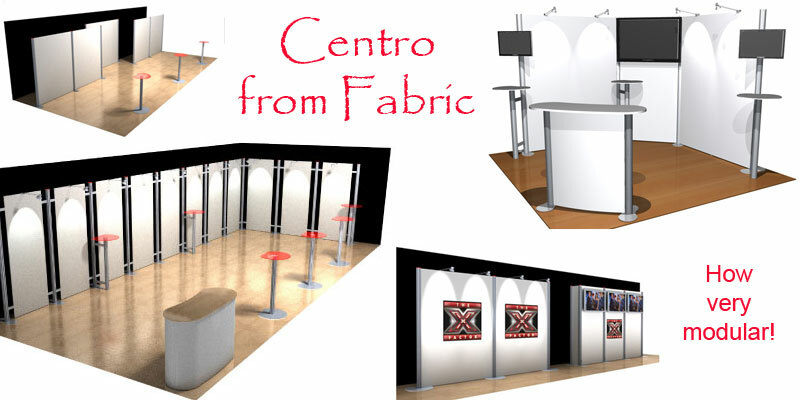 We create complete exhibition stands, freestanding screen displays and partitions from the excellent new Centro. > Fast to install thank to the Twist and Lock feature. 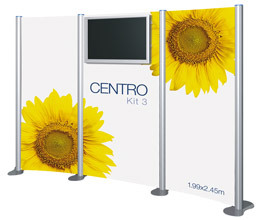 > Attractive silver finish adds to the overall impact of your graphic displays. > Bracket sections for iPad Holders and screens 22"- 42"
All the designs you see on this page have been created from the excellent Centro system. Look how easy the new Rotrlink system is to use! A smart and practical display unit with shelving and branding! These superb theatre system will accommodate screens between 32" and 42". 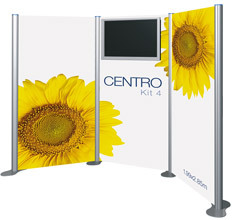 It is purpose built and is finished off with magnetic graphic which can be changed instantly. Portable and versatile! As usual you will be able to change from coloured post caps (no extra charge) and a range of accessories including lights, tables and transit cases.